It's challenge time! Each month in 2012, the blog team members at Scrapbook Express share a new sketch to use to document monthly activities. Here's my project for August. Be sure to check out the SE blog for the actual sketch and product details! The designers at myStampBOX and Clearsnap joined forces this week to enjoy each other's products. Today I get to share what I made! Every once in a while I get on a jewelry-making kick, and this time was no exception! 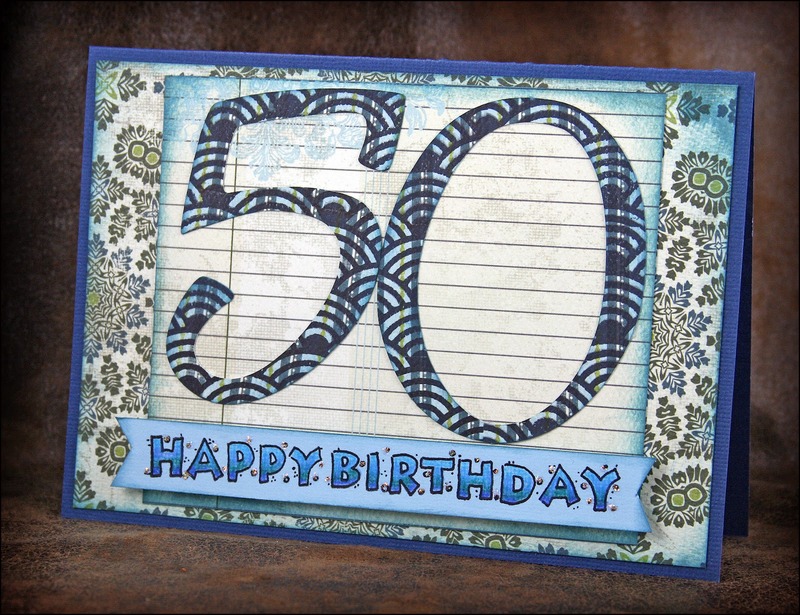 I stamped a piece of silver cardstock using ColorBox Sea Crystal Chalk Ink and Pigment Inks in Raisin and Blue Jean. 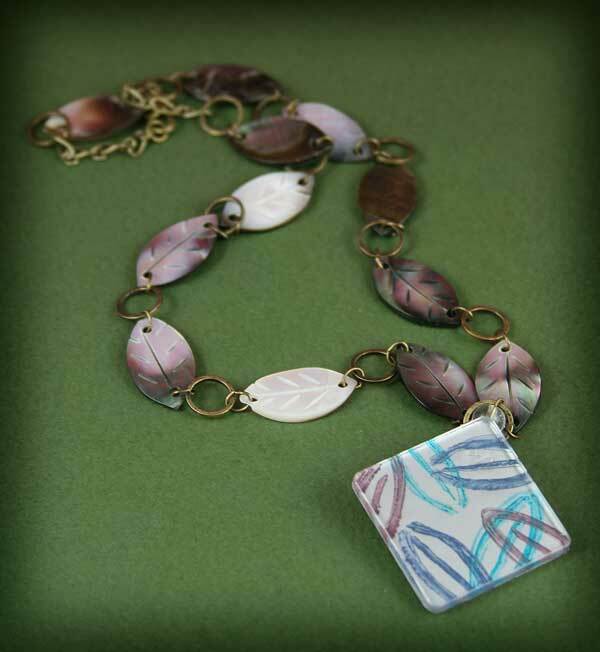 I was inspired by the iridescent colors of the leaf beads and tried to match their hues in ink. The small leaf from A Flower For You was the perfect shape and size for this project. Then I made a card to go with my jewelry piece. I stamped some images from Floating Leaves onto an ATC using Pigment Inks and heat set. 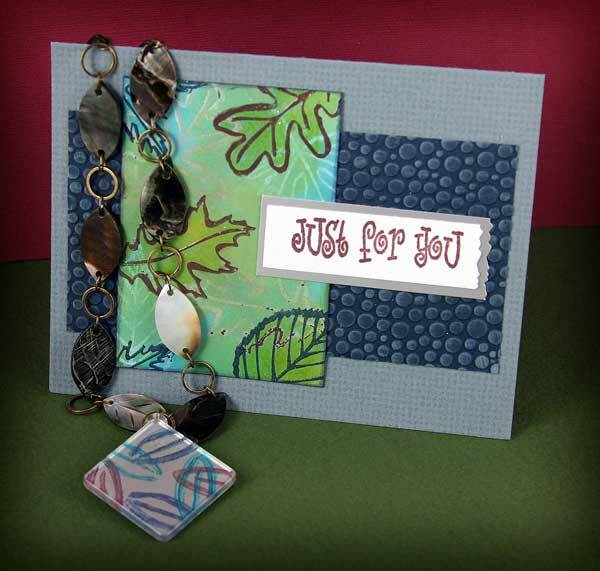 Then I rubbed Guacamole and Sea Crystal Chalk Inks over the ATC, creating a batik-like effect. I restamped the leaf images using Raisin and Blue Jean Pigment Inks and heat set using Clear Top Boss embossing powder. The navy cardstock panel was embossed using a Cuttlebug embossing folder and rubbed with Wheatgrass Pigment Ink to enhance its texture. 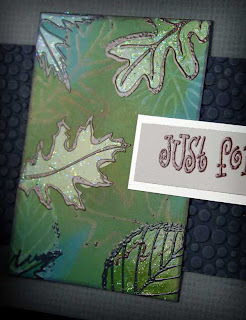 I added a little sparkle to the main stamped leaf images using Frost Smooch Glitz. The sentiment was stamped in Raisin Pigment Ink from the Mention It stamp set and clear embossed as well. I love getting a chance to combine myStampBOX stamps with other product partners, and Clearsnap is certainly a perfect match! Special thanks to the Clearsnap folks for sharing some goodies with us and teaming up to create awesome projects. Be sure to check out the myStampBOX and Clearsnap blogs today for more inspiration. Leave comments on both blogs for a chance to win prizes, too. The designers at myStampBOX are sharing projects with simple stamping today on the blog. Ink and paper is where it's at! Hop on over to see what we made. Here's what I made! I used a Christmas (yes, Christmas!) 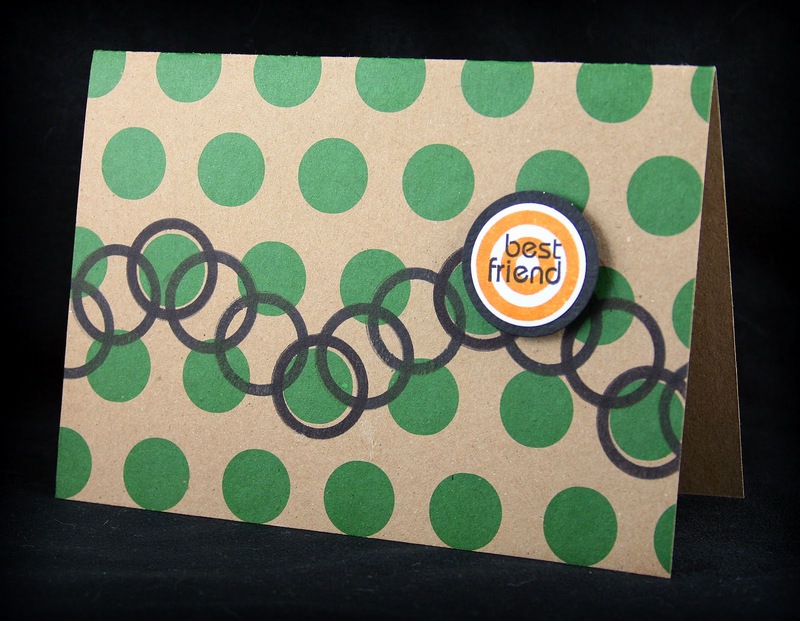 card base from product partner Canvas Corp and stamped black rings from Funky Circles to create a fun border. I stamped a second layered ring stamp in Wild Honey Distress Ink and added a sentiment from Small Greetings right over the top. 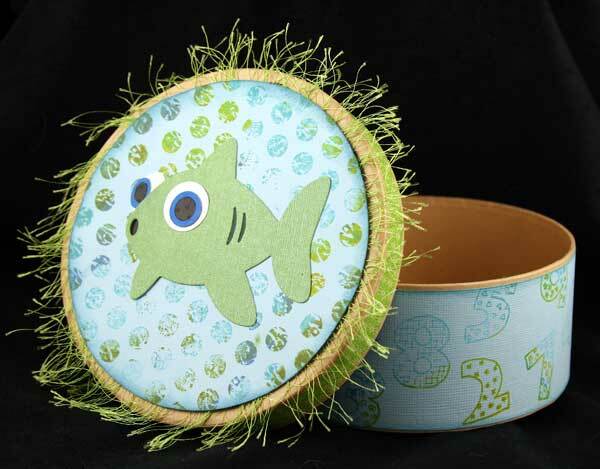 The sentiment circle was layered on cardstock and attached to the card using foam adhesive, allowing the message to pop up over the caterpillar-like border. Simple stamping, great result! 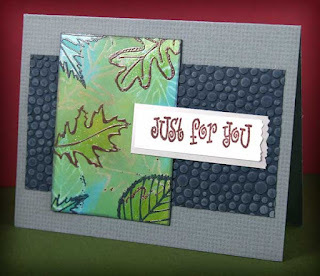 Be sure to check out all the KISS projects at the myStampBOX blog! 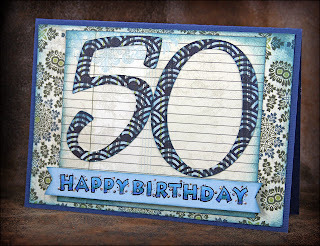 This weekend I was honored to celebrate a friend's 50th birthday with him, and I made him this card to celebrate. 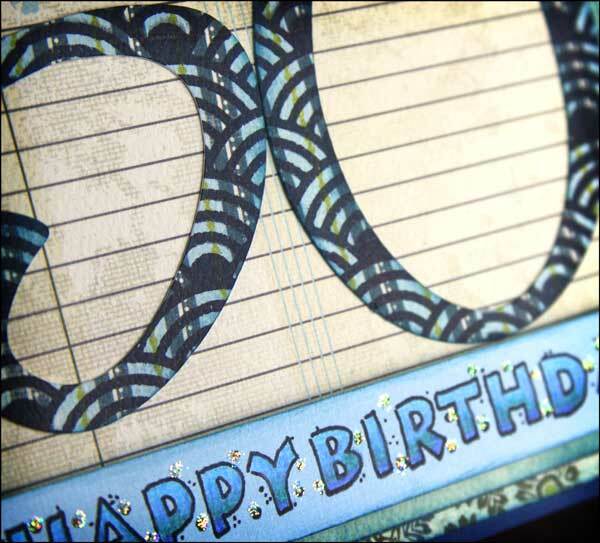 I created my own background paper using a new CHA release stamp Decorative Strips designed by Karen Ellis. I used it to cut the large 50 numbers using my Cricut. The sentiment at the bottom is from Birthday Numbers. I hope you can share your love of crafting with someone special just like I did. Happy stamping! Check out the fishy details on my stamped box at the myStampBOX blog today!